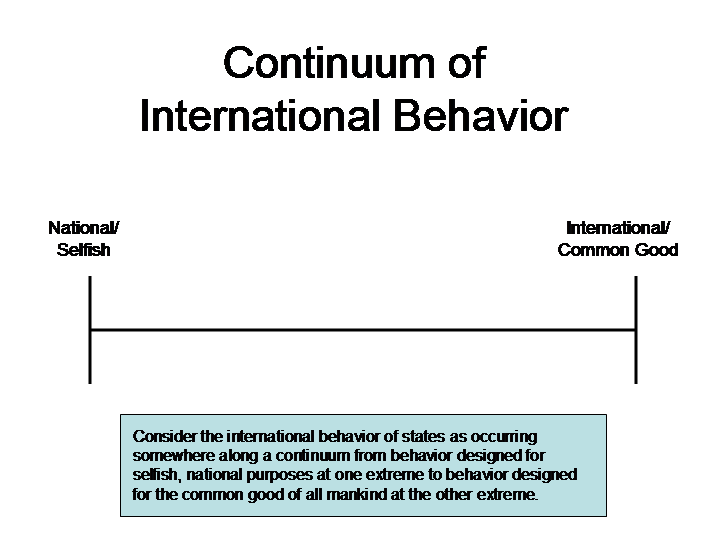 Consider a single dimension along which all possible state behavior in the international realm might be located, going from behavior with national (i.e., selfish and possibly sub-national) objectives at one extreme to behavior with international objectives (i.e., for the common good) at the other. Implicitly, behavior for selfish reasons that is also in the best interests of everyone else can be considered to be for the common good (after all, “we” are part of “everyone”). Locating whatever behavior is being considered by ourselves or our adversaries on this continuum, then we could discuss offers the hope of enabling a much more intelligent discussion of what we think about that behavior. The breakthrough step toward accomplishing this apparently simple task may be to enumerate who gains and who loses. The hot knife of identifying winners and losers would slice through the butter of our opaque foreign policy debate, exposing all manner of bias and false assumption. 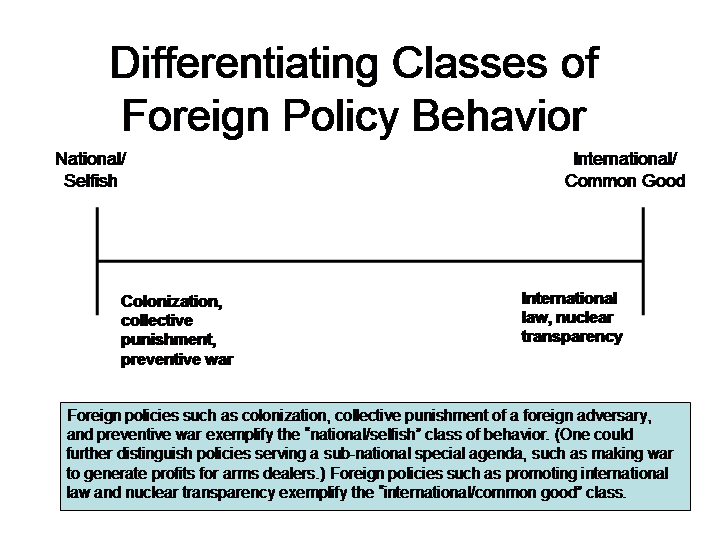 For research purposes, the above chart can be focused on a specific issue or policy, e.g., the Palestinian-Israeli dispute as illustrated in “Differentiating Friends from Foes.” For educational purposes, training citizens of a democracy to understand the Tragedy of the Commons is, it should go without saying, an essential task. Adding generic policies that are common in global affairs today on the continuum can help citizens to understand the kind of policies their government is actually implementing, with all the patriotic hype stripped away. For example, this approach can aid citizens to make informed judgments about the propriety of a global power asserting the right to engage in preventive war in the absence of a clear and present danger to national survival. Using this simple continuum immediately changes the terms of the debate in a very health direction. Without the chart, the debate in practice tends to degenerate into an argument of whether or not one can “oppose the President” without being a “traitor,” a pernicious argument that opens the door to abuse of power. With the chart, the debate is nudged in the more analytical direction of asking how a policy on the selfish end of the scale in principle can ever be justified in practice. Perhaps it can, but the chart helps puts the burden of proof where it should be: on those who wish to violate the principle. Without knowing the principle, one can hardly assess whether or not it is being violated. Being able to take such an honest view of one’s own government’s policies is critical to informing the population so that democracy can function. The use of this method is of course in no way restricted to foreign policy analysis. One could, for example, equally well prepare a chart of “Financial Behavior,” perhaps placing Wall St. activities that promote the growth of industry at the Common Good end and Wall St. activities that lay bets on the probability that some group of homeowners will default on their mortgages at the Selfish end. The broadest lesson here is that our public debate on policy is so confused and ill-informed that even the most elementary methods for introducing rigor can have great benefit. Imagine the above chart accompanying a glib newspaper report on a leader’s speech announcing the launching of a preventive war!